Display your favorite MiniFigures in this LEGO Small MiniFigure Display Case! 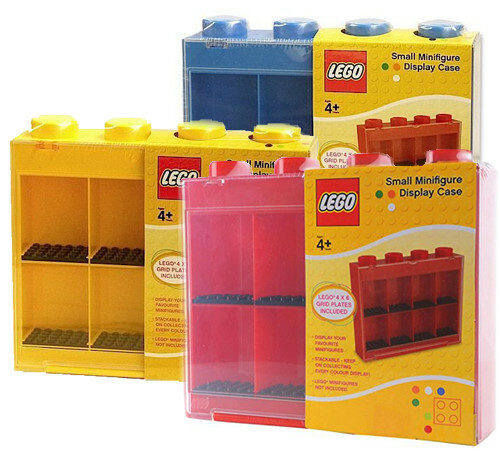 Display Case has 8 compartments with LEGO grid plates to hold MiniFigures. The case is stackable or can be hung on a wall by built-in slots on the back. Its cover opens and closes with a push button for easy access to your figures. Please note: To select a color, specify which color you want in the checkout when preparing to pay. BOTTOM PLATE MAY VARY IN COLOR. Also, the main color is picked randomly, unless you choose a color. LEGO®, the LEGO logo, the Brick and Knob configuration are trademarks of the LEGO Group. ©2012 LEGO Group. Please note: To select a color, specify which color you want in checkout when preparing to pay. BOTTOM PLATE MAY VARY IN COLOR. Also, the main color is picked randomly, unless you choose a color.